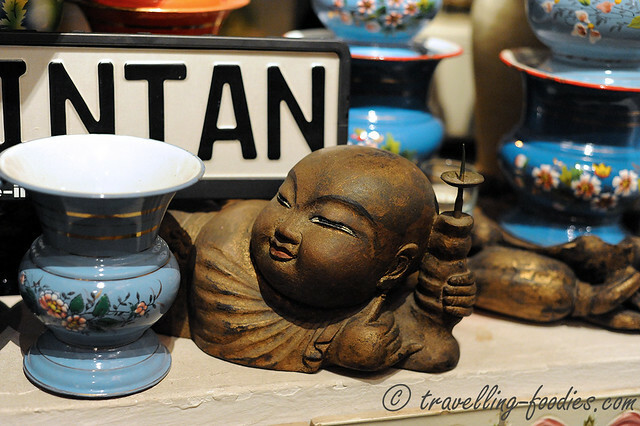 About a month back, I had the pleasure of visiting The Intan, a privately owned Peranakan themed museum located in the heart of Joo Chiat, one of the enclaves of Nyonya-Baba culture and heritage in Singapore. It was my second visit to the Intan, the first being a collectors’ sale organised more than 2 years back. The visit was held in conjunction with the release of this year’s Lunar New Year angbaos by the National Heritage Board (NHB). What made the visit special was the fact that it was held at night. Not your regular run-in-the-mill visits to a museum I’m sure. But the dim light conditions did pose a “challenge” to photography. After all the hustling and bustling in the kitchen during the Chinese New Year period with all the cooking and baking to be done, I finally had time to sit down and sort out the photos and write a bit about the visit. So here’s a small collation of some shots I took. Enjoy! “The Intan” literally means rose-cut diamond in Bahasa Melayu as well as the Baba patois. 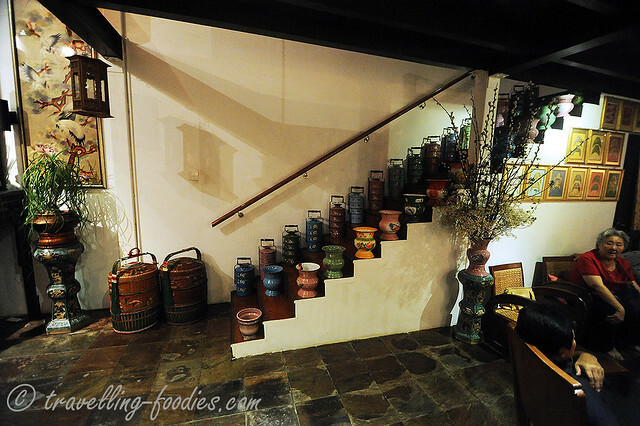 True to its name, this terrace house-turned-museum is indeed a little gem hidden within the very many small lanes and streets in the Joo Chiat-Katong area where many Peranakans in Singapore still reside at. 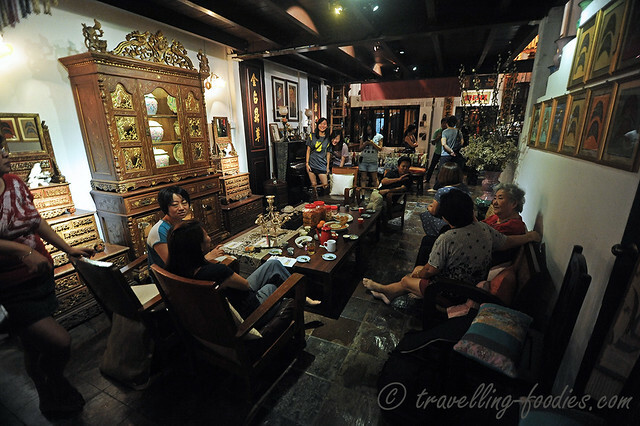 Unlike the other museums which are managed and run by the NHB, The Intan is actually the private residence of Alvin Yapp, a Baba, as well as an active member of the local Peranakan community himself, who turned it into a museum showcasing artifacts iconic and symbolically reflective of the rich and colourful lifestyles the Peranakans led in the past. Some of the artifacts on display are heirlooms handed down the Yapp family, from Alvin’s forebears. Others, he collected over the years, from furniture, to porcelain, beadwork, embroidery and jewellery, forming the impressive lot we now see in The Intan today. A peek at one of the pairs of large lime green offering dishes nested within the gorgeously ornated three-compartment “brown and gold” teak cabinet located within the main hall. 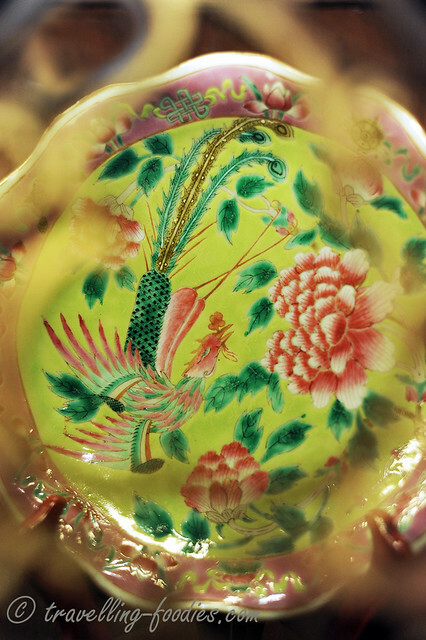 Scallop edged with a thick famille rose overglaze embellished by the eight Buddhist symbols on the rim, the central motif bears a phoenix with a three-prong tail in flight accompanied by blooming peonies on the sides, all symbols which are commonly perpetuated through Straits Chinese artifacts of various genre and media. One of the beautiful kamchengs on display with lime green background and pink ogival panel with a powder blue outline. 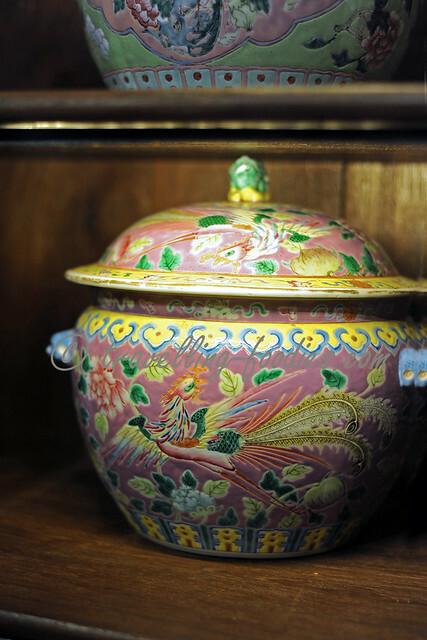 Peranakan porcelain pieces, otherwise known as “nyonyaware” are well known for the bold use of colours and contrasting schemes. The phoenix in flight as well as the surrounding peonies are all very neatly drawn and painted, especially the detailing on the tail feathers. A very beautiful piece. Then is yet another lime green kamcheng with the same colour scheme as the first, but now with a standing phoenix on faux rocks, once again flanked by peony blossoms on the sides. No less impressive! The third is a pink kamcheng with several large phoenixes in flight on both the body as well as the cover, without the constraints of ogival pandels. Easily my favorite piece of the three. 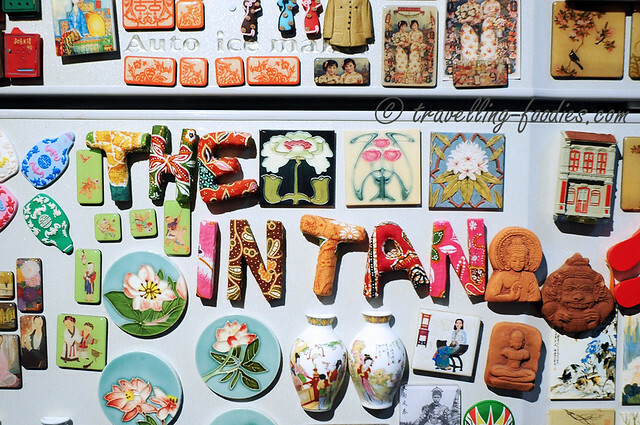 Within the same cabinet lies other stunning pieces of “nyonyaware“, i.e. 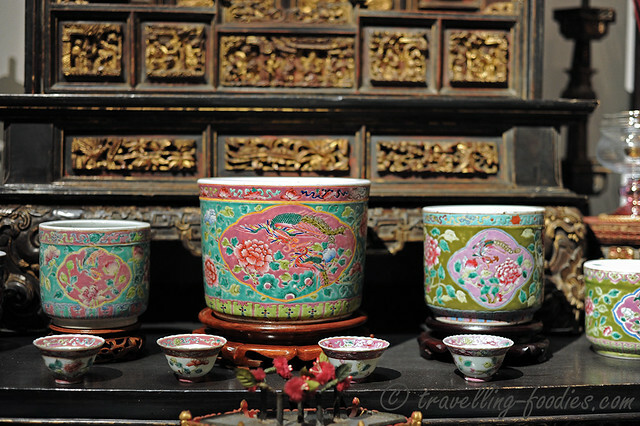 more kamchengs as well as large pheasant-themed bowls and blue and white ware with gilt outlines. A silver tempat sireh set placed right on the table in the main hall just next to where our drinks and snacks are served as well. One thing particular I like about The Intan is how one could come really upclose and personal to scrutinise every single detail on many of the artifacts which are displayed without the confinements of glass panels or lined up barricades one would expect in a prototypical museum setting. Without the restrictions of a physical barrier, what separates the admirer and the artifacts is really an open heart to appreciate the true beauty these pieces exude. 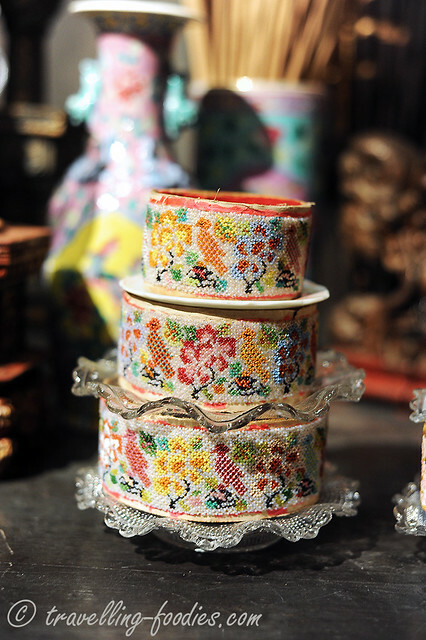 One should be mindful that many of them are old, and probably well used by the Peranakans of the past. Slight flaws and defects are only to be expected, just like the leftmost tobacco container which is missing a finial, or the fact that the various containers may have been assembled from different sources and did not come originally as a set. But for me, this reflects the very reality of such pieces and speaks of how utilitarian peranakan ware actually were in the past where missing and broken pieces got replaced with similar items periodically. The grand piece which one would be greeted by as one steps into the Intan, a reconstruction of a “semayang abu” which is made up of a grand two-piece tok semayang (offering table) intricately carved, probably of blackwood with most of its gilding intact. 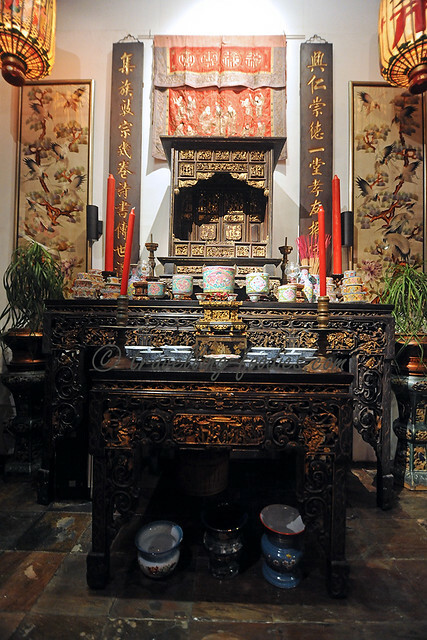 The lower square table holds a chanab surrounding by porcelain offering ware, while the taller long table sits a gigantic shrine cabinet, otherwise known as the rumah abu or rumah datok. 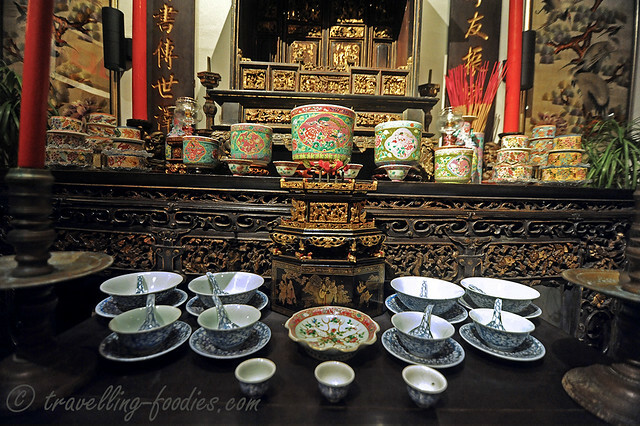 Likewise, it is surrounded by other offering paraphanelia like vases, oil lamps, candle sticks, joss-stick holders and censers. A slightly closer look at what were on the tables. 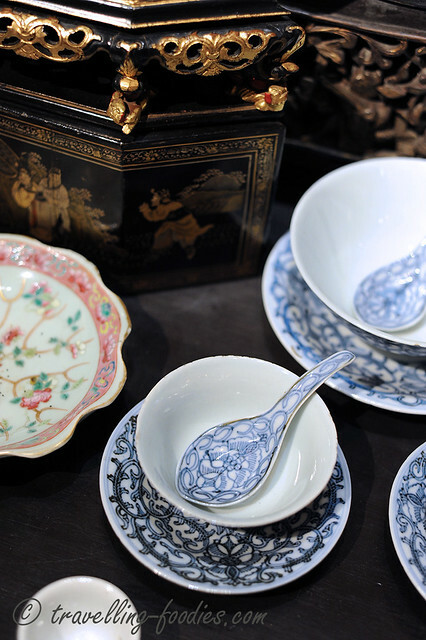 Blue and white porcelain ware bearing the motifs of formalised scrolls and butterflies, known as “kitchen ching” or “batik ware” amongst porcelain collectors. They are commonly, though not exclusively used in Peranakan households for presenting laok semayang (offering food) during prayers. 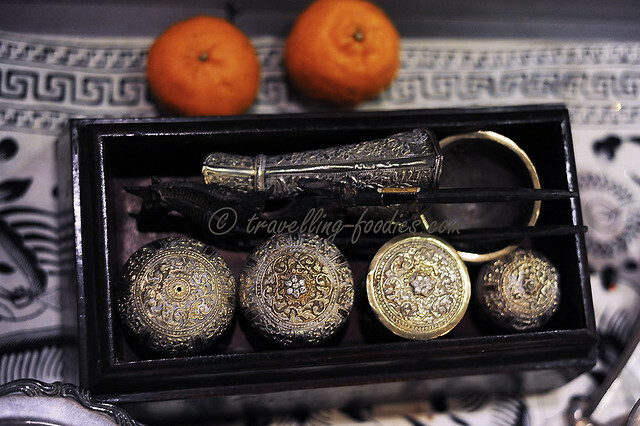 A beautiful collection of censers in various sizes. The central piece which is incidentally the largest bears a pair of red-faced phoenixes and familiar colour schemes associated with a particular porcelain maker from the Jingdezhen kilns who often marked his creations with an iron-red seal mark scripted as 詹福兴造 Zhan Fu Xing Zao on the underside of the porcelain pieces. 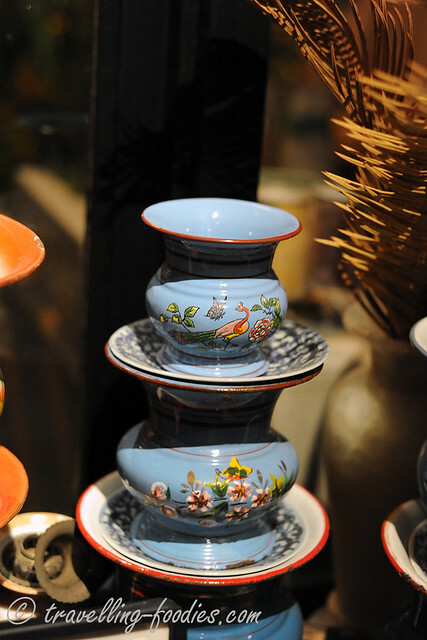 The other smaller censers, crafted by other makers like Zhan are by no means less impressive. An interesting way for displaying altar beadwork pieces separated by glass plates known as “dodol piring”, characterised by their wavy and fluted edges as well as the beady-textured undersides around the borders. They got their name after kueh dodol, a popular kueh enjoyed during Chinese New Year which incidentally requires quite a bit of elbow grease to make, and were commonly served in these glass plates. 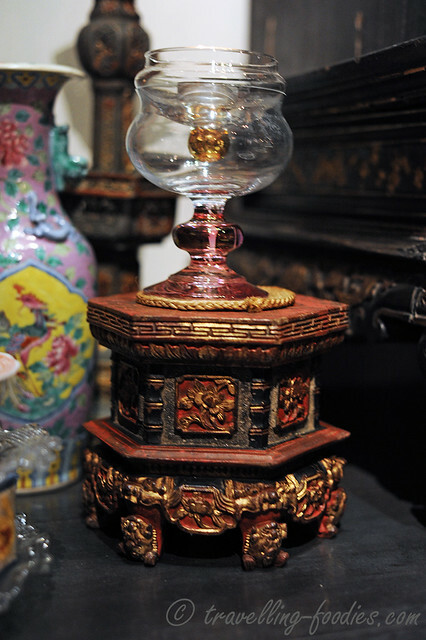 One of a pair of “red and gold” oil lamps, otherwise known as “pelita minyak” with the lower piece carved out of presumably namwood, intricately crafted with a lion head on each of the “legs” at the base. 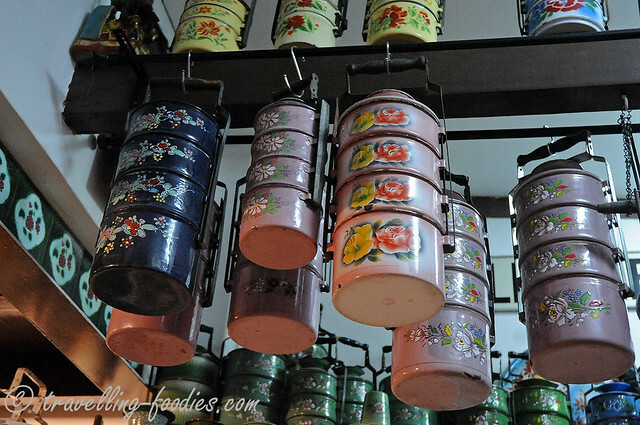 A sizeable collection of hand or table top enamelware spitoons known as “tam pwee” traditionally for containing expelled phlegm, but also used for “disposing” thoroughly expended and chewed “sireh“, a practice adopted by the Peranakans from an older Hindu-Malay origin. Chewing “sireh“, which comprises of a mixture of betel nut, sireh leaves, gambier and lime, is common throughout the larger Asian communities from the aboriginal tribes in Taiwan all the way down to Indonesia. An interesting candle-stick of a baby lying on his tummy and head tilting sideways, which reminded me of the 北宋汝窑婴儿枕, housed at the 台北故宫博物院. 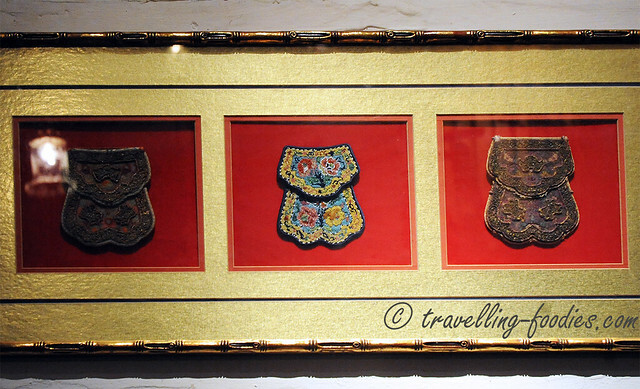 A collection of beaded wedding purses framed and hung on one of the decorated walls at The Intan. These purses like many others like the bridal handkerchiefs (bimpoh kermantin/bimpoh lenggang) and embroidered kneepads are largely ceremonial and ornamental with no practical use, a reflection of the highly lavished and decorated lifestyles some of the more privileged Peranakans led in the past. 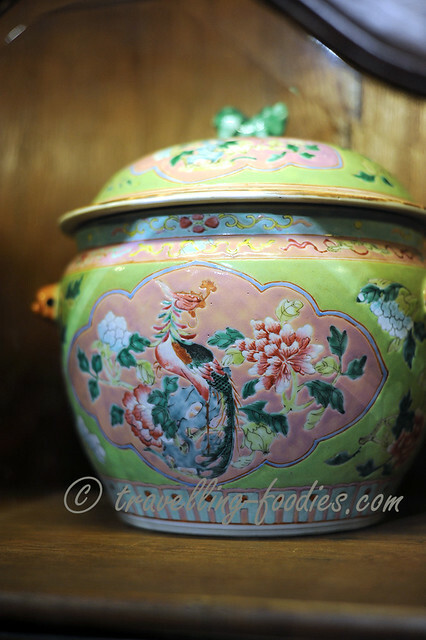 Apart from its collection of Straits Chinese furniture, porcelain, silver and beadwork/embroidery, The Intan is probably most known for having one of the largest, if not the largest collection of enamelware tiffin carriers in Singapore. 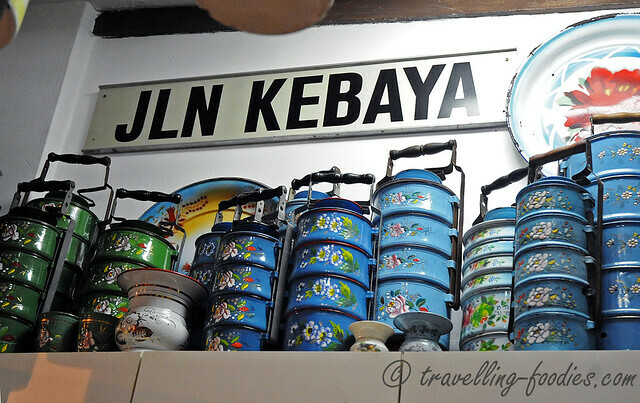 Known as “tengkats” to the Peranakans, these multi-layered lunchboxes were used for containing and transporting food in the past. These old, fully enamelled pieces made mostly in Czechoslovakia were often beautifully embossed with floral and bird motifs making them a great pleasure to admire and collect. And as one run out of shelf space for them, they could also be hung up using whatever small footprints possible. 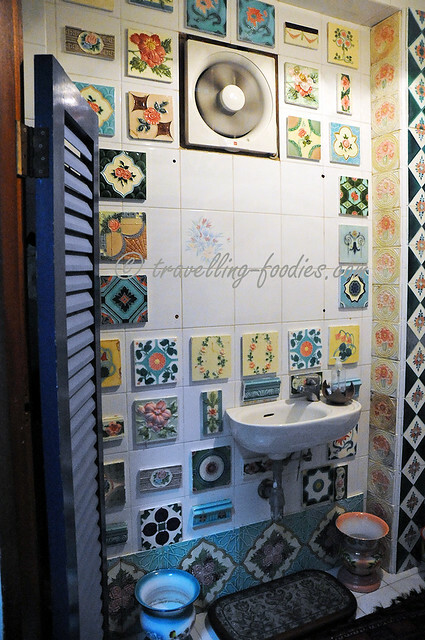 Even the washrooms are not “spared”, as they are heavily decorated with colourful majolica tiles, made all the way back in the Victorian era. 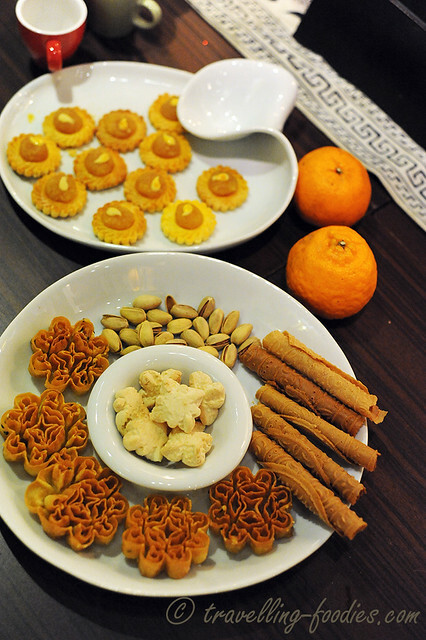 A small reception of snacks being offered at the open house, all familiar goodies served during the Chinese New Year like kueh goyang, kueh belandah, kueh bangket and of course, the popular kueh tair (pineapple tarts). Unfortunately, the open house was confined only to the first level of the Intan. Owing to inadequate lighting conditions available, I was unable to get good shots of the outstanding collection of the Intan’s tengkats and tam pwees placed along the staircase as well. 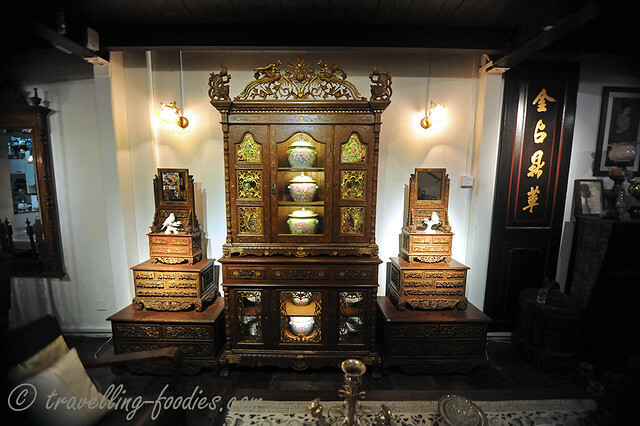 Hopefully an opportunity would avail itself in the near future for us to explore the second floor of The Intan, where I’m pretty sure more Peranakan treasures await to be discovered and admired. Nonetheless, a big thank you to Alvin as well as his parents for their generous hospitality! Do note that visits to the Intan are strictly by appointment only. No walk-ins available. 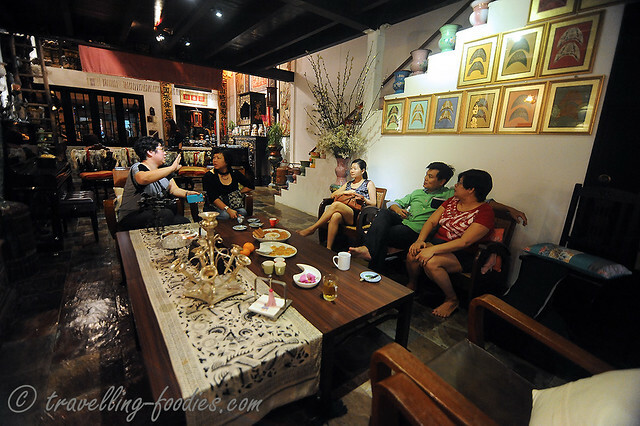 This entry was posted on February 13, 2014 by Alan (travellingfoodies). 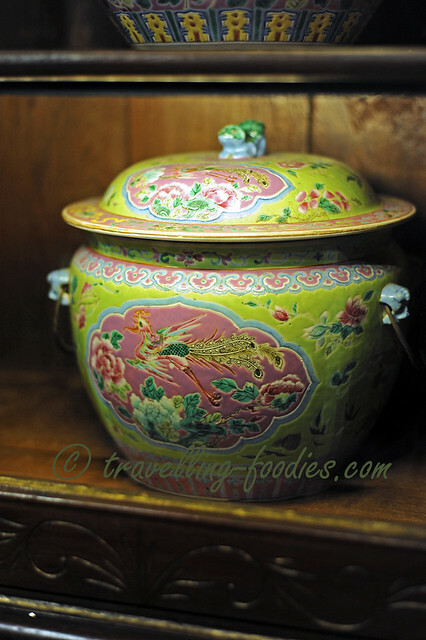 It was filed under Food, Travel and was tagged with Baba, brown and gold, censer, Intan, Joo Chiat, kamcheng, Katong, kitchen ching, museum, Nonya, Nyonya, peony, Peranakan, phoenix, private museum, Singapore, sireh, straits chinese, tempat sireh, tengkat.